Take our Arizona Defensive Driving School course online to get your ticket diverted or to satisfy a court requirement for defensive driving. Enjoy a convenient and affordable traffic school program. Get Your Ticket Diverted or Satisfy a Court Requirement. Our Course Meets the State's 4-Hour Requirement. We Guarantee Satisfaction with Our Course! Please See Our Refund Policy. We Notifiy the Court of Your Completion for Free. Find out what you need to take an Arizona Defensive Driving course. View the List of Eligible Violations to See If Yours Qualifies. Read About the Seven-Day Rule, Which Requires You to Complete Your Course 7 Days Prior to Your Court Date. Gather Your Paperwork for Registration. Feel Free to Contact Us If You Need Any Help. We Provide AWESOME Customer Support (1-800-763-1297 or support@safe2drive.com). The total cost to take the Arizona Defensive Driving course is the total of the school fee, state fee*, state surcharge, and court diversion fee. Please select your county and court. Check if your court is approved. Find your court. We are approved by the Arizona Supreme Court for nearly all Superior court locations. Review your price. Safe2Drive guarantees the lowest price. Call us if you find one lower. Create a username and password. You use these credentials to log in and out of Safe2Drive. Is this Defensive Driving School the same as Traffic Survival School? We do NOT offer the Traffic Survival Program. We only offer Defensive Driving School (a.k.a. Traffic School). You have not attended an AZ DD Program for ticket dismissal in the last 12 months of the date of this citation. The violation did not cause injury or death. You are not less than seven days away from your court date. In order to be eligible, your violation must also be on the list of eligible violations. 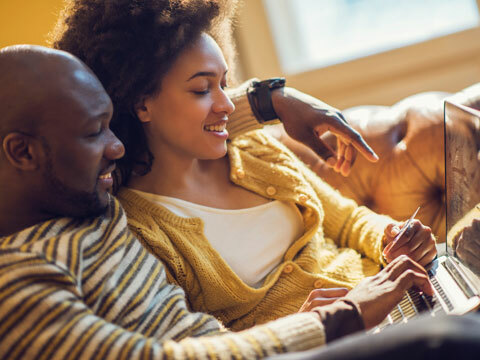 Once you have completed the registration process, we use the information you provide to ensure your eligibility with the State of Arizona. Eligibility is typically verified within 30 minutes of registration. Watch for your eligibility alert on our "Welcome Back" page after you log in. Note:The "Welcome Back" page does not refresh itself. Please refresh your browser if you do not see the eligibility alert. Your court is identified on your citation by id, name, address, and zip. It helps to know the county in which your court resides. Each court in Arizona has a unique ID. This is the most reliable way to find your court. We have noticed strange things about some court names. Sometimes the court name on the citation is not the name the Arizona State Supreme Court uses. Cochise County Justice Court Precinct 5 is also called Sierra Vista JP (ID:0205). The words 'Magistrate Court' and 'City Court' mean 'Municipal Court'. Maricopa Municipal Court is in Pinal County ... not Maricopa County. Send a copy my citation and driver license? Take a picture and upload it or e-mail it to us. Take the picture head on. Faxes are often hard to read (too faint). Avoid delays by using a marker to pencil in. When must I finish? Continuance? The State of Arizona requires that you finish the course seven days prior to your court date. Rules for continuances vary by court. Call the Court for the best information. All schools are required to collect the state fee and court fee. These fees are then sent onto the state and court respectively. State Fee = An administrative fee for giving you the privilege of taking defensive driving. Please note, due to a recent law change (HB 2527), students who receive a ticket on or after January 1, 2019 will be charged a state fee of $24. Students who received a ticket before January 1, 2019 will be charged a state fee of $20. The state surcharge is $45. Court Fee = Another administrative fee. We pay your court fee directly to the Court Clerk. The State fee and Court fee are not fines. Your fines were waived when you chose the option of defensive driving. Once a student begins the course, there will be no refund of the course fee. If a student requests a refund before they start the course, we will issue a refund of the course fee minus a $15 processing fee. 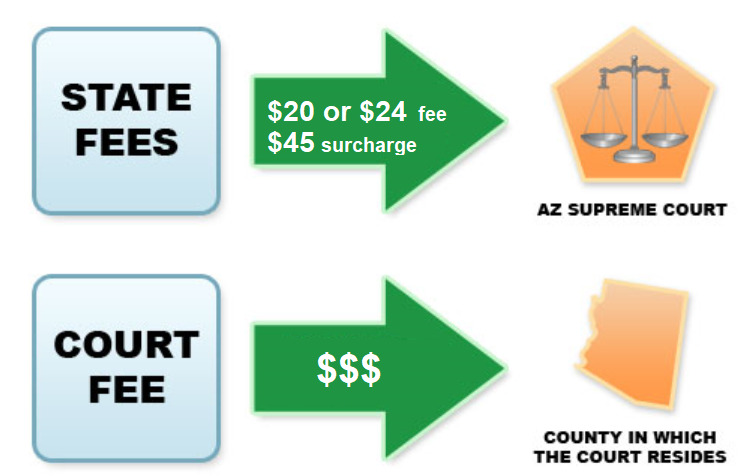 The State of Arizona has specific rules about when state and court fees may be refunded. Your state and court fees will only be refunded if you did not start the course, the officer failed to file your citation with the court, or your citation is dismissed by a jurisdictional court on its own motion for technical problems not correctable under civil traffic rules of court. Although the state fees will not be refunded under any circumstances other than those stated above, at its discretion, a court may allow a refund of a court diversion fee to a student (this is a court by court decision). When does the court get my money? We mail checks once a week. They usually arrive at the court house in 7 days or less after completion. Our Arizona Defensive Driving course is four hours long, as is mandated by the state of Arizona. The course consists of 16 short lessons that are timed to ensure you spend the minimum required time in the course. At the end of each lesson is a 3-question multiple-choice quiz. You must answer all three questions correctly to proceed to the next lesson. You may retake the lesson quizzes as many times as necessary to pass. Throughout the course, you will encounter identity verification questions, as is required by the state of Arizona. These are questions that are unique to you that you will answer during registration and then answer again as you encounter them in the course. According to Arizona’s rules, you must answer the identity verification questions correctly to proceed with the course. If you answer an identity verification question incorrectly, you will be presented with a second question. If you answer that second question correctly, you may proceed with the course. If you answer the second question incorrectly, you will be prompted to call our Customer Support line, where we will attempt to verify your identity. If we are able to successfully verify your identity, you will have to start the course over from the beginning. This identity verification procedure is required by the state of Arizona for all Defensive Driving courses. There is no final exam in our course. Once you complete the last lesson quiz and answer the final identity verification question, you’re done! We will ask you to complete a quick course evaluation form at the end of the course. Let us know what you thought about your course experience! When you complete the course, you can print a Receipt of Completion to keep for your records. 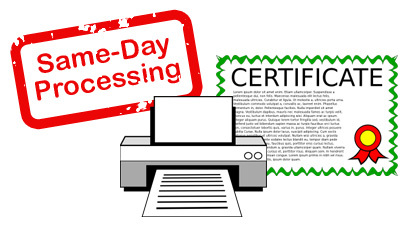 We will electronically notify the court of your completion within 1 business day. The courts do not process the completion in their system until they have received the payment. Please be assured that the court will process your completion using the date you completed the course, not the date that they process the completion. Be sure to check with the court 7-10 business days after completing the course to ensure they have processed your completion. Must I finish in one sitting? We provide an unlimited number of logins. Just use your username and password to login. We take you back to where you left off each time you return. We record the amount of time you spend in each lesson. Throughout the course, you will encounter identity verification questions. These are required by the state of Arizona to ensure you are the one completing your course. Identity verification questions are questions that are unique to you that you will answer during registration and then answer again as you encounter them in the course. One example of an identity verification question is, "What is your favorite color?" You must select your answer from a dropdown menu we provide. According to Arizona’s rules, you must answer the identity verification questions correctly to proceed with the course. If you answer an identity verification question incorrectly, you will be presented with a second question. If you answer that second question correctly, you may proceed with the course. If you answer the second question incorrectly, you will be prompted to call our Customer Support line, where we will attempt to verify your identity. If we are able to successfully verify your identity, you will have to start the course over from the beginning. 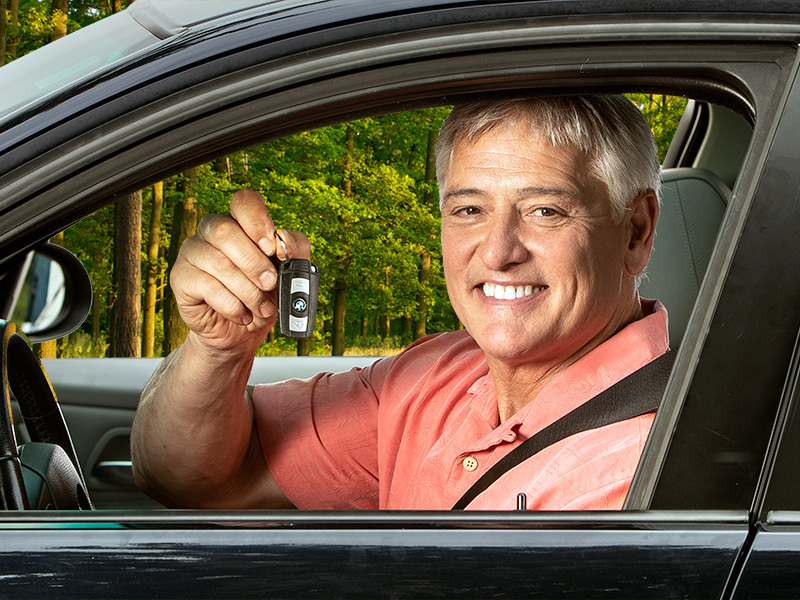 According to the state of Arizona's rules, these identity verification procedures must be followed by all Defensive Driving courses in the state of Arizona. No. There is no final exam in our course. Once you complete the last lesson quiz, pass the last identity verification question, and fill out the course evaluation form, you're done! 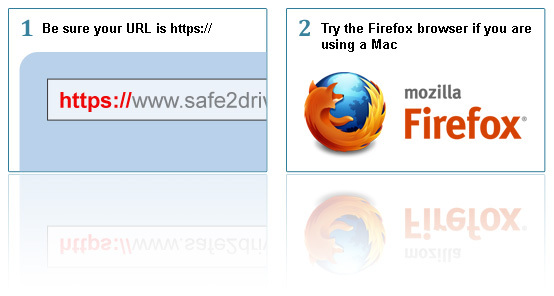 Try using the Firefox browser if you are using a Mac. Safe2Drive is required to notify your court electronically of your course completion. We also forward your Diversion Fees to your court. Please allow the court ample time to process your course completion. Note: Your court goes by your completion date, not the date they process your completion. Be sure to check with the court 7-10 business days after completing the course to ensure they have processed your completion. When do I get my Completion Receipt? You can print a copy of your Receipt of Completion for your records after you complete the course. We also notify the court electronically that you finished. Be sure to check with the court 7-10 business days after completing the course to ensure they have processed your completion.